Welcome to Majic Carpet MD! We have offered superior carpet cleaning services for homeowners and businesses in Colorado Springs since 1995. Our business is locally owned and operated, and that is reflected in the superior quality of our work. Whether you are a hardworking homeowner or a proud small business owner, carpet cleaning in Colorado Springs, CO is one of those things that too often falls short of the desired mark. Fortunately, it doesn’t have to be that way—not when you talk to a dependable carpet cleaning contractor like Majic Carpet MD to remove all types of stains or odors from your carpets. Our owner-operators, Steven and Candace Furnish, have been in the carpet cleaning industry over 20 years! We have been cleaning one carpet after another in establishments located in the Colorado Springs metro area and throughout Colorado Springs, and we look forward to cleaning yours soon as well. 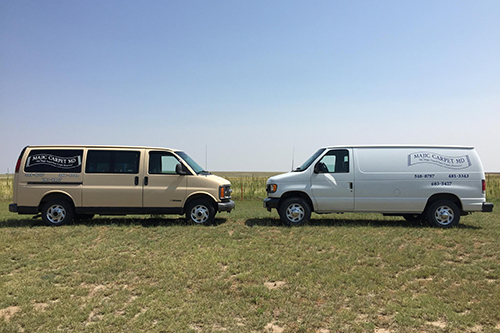 We are a proud locally owned and operated small business in Colorado Springs, CO.
Our specialized services included upholstery cleaning, pet odor removal, RV cleaning and much more. We only employ hardworking, experienced and friendly technicians.